Have You Tried Our New European Candy Bars? Ready to switch up your snack time with our new selection of European Candy Bars? 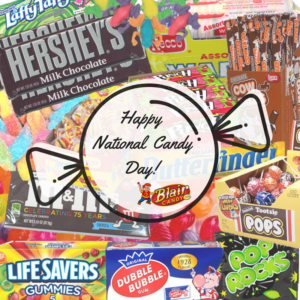 We’re adding more and more international candies on BlairCandy.com! In previous blogs, we’ve talked about German chocolatier Ritter Sport, but today we’ll talk about our newest arrivals from the United Kingdom. 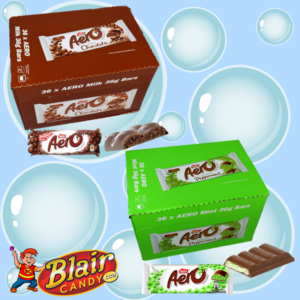 The Aero Bar (Pictured) is a chocolate bar that has been made in a way that leaves the insider bubbly and textured. This candy comes in a milk chocolate flavor and a chocolate mint flavor for a bubbly time! If you enjoy fruity gummy candy, like JUJU Bees or Dots, then you should try Rowntrees Fruit Gems. They come in flavors like orange, strawberry, and lime and are a colorful, chewy treat. Love chocolate and coconut? Then you have to try a Bounty bar! Each bar is packed with coconut and covered in a sheet of chocolate. There’s plenty of other new treats to try! Head over to BlairCandy.com and visit our UK Candy page to see these and other European Candy Bars. Kids will love snacking on their Halloween candy for a few days, but then they’ll start to get tired of their Halloween haul. Fight snack time boredom with one of these recipes that uses up the rest of that Halloween candy. Have melting chocolate? Then you can make this Halloween Candy Bark! See the recipe on Annie’s Mom here. If you’ve been craving brownies, then these loaded candy bar brownies need to make their way onto the menu. See the recipe from I Heart Naptime here. Have you ever wanted to try making your own ice cream? If you have, then this recipe will help you do that plus get rid of extra candy. See this recipe on The Cookie Writer blog here. Do you have your own ideas on how to use up extra Halloween candy? Be sure to tag us on social media to show us what you’ve made. 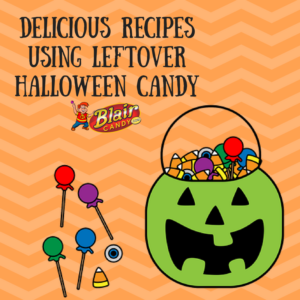 If you need extra candy for your recipes, stop by BlairCandy.com. You’ll find all of your favorites and maybe even a few new ones!